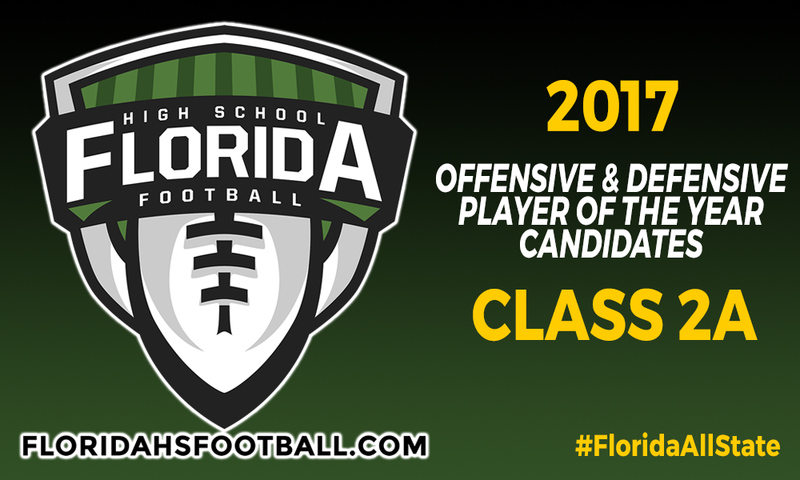 GAINESVILLE, Fla. — With the final step to fully closing the 2017 season is almost here, we are proud to reveal our candidates for our Class 2A Player of the Year candidates. For Coach of the Year, five coaches are selected as candidates based upon the resume they had for the season. For Player of the Year, three players are selected on offense and three on defense as candidates for Offensive Player of the Year and Defensive Player of the Year. One player from each classification of the six candidates total will be selected as the Overall Player of the Year for their respective classification. • QB Jaylin Jackson, Sr., Tampa Cambridge Christian – A true two-player, Jackson did most of his damage on the offensive side of things responsible for 45 touchdowns through the air or on the ground this season racking up over 3,500 yards of offense in the process. • RB John Cox, Sr., Moore Haven – Led Class 2A running backs in rushing yards (1,815) and touchdowns (25) as the heart and soul of the Terriers undefeated regular season. • QB/ATH Clayton Boyd, Sr., Jacksonville University Christian – Boyd was responsible for nearly 3,000 yards of offense through the air or on the ground scoring with 24 passing touchdowns, while rushing for 12 more on the ground leading the Fighting Christians to Orlando for the third straight season. • DL Jesus Machado, So., Hialeah Champagnat Catholic – Only a sophomore, Machado made the most of it as one of the leaders of the Lions’ state championship winning defense, collecting 21.5 sacks to go along with 79 tackles, two defensive touchdowns, five forced fumbles and 3 fumble recoveries. • LB Khalan Tolson, Sr., St. Petersburg Admiral Farragut – One of the top linebackers in the state the last two seasons, Tolson was a force to be reckoned with, collecting 108 tackles, 37 tackles for loss, 16 sacks and forcing eight fumbles. Also spent time on offense for the Blue Jackets. • LB Donovan Georges, Sr., Hialeah Champagnat Catholic – Another wrecking ball at linebacker, Georges caused opposing offenses major problems, racking up 17 sacks, while collecting 64 tackles, forcing six fumbles, recovering three fumbles and scoring two defensive touchdowns.